- Book fair organized by Centre André Malraux with Shahinpasic and Comme un roman bookshops, at the Holiday Inn. Discussions with authors. - 18:00: Film screening ‘Shooting Robert King’ by Richard Parry. - Q&A with the guests: producer Richard Parry and cameraman Vaughan Smith (director of the Frontline Film production). Media Center. - 20:00: Photo Exhibition ‘A Long Way. Bosnia, the Shame of Europe’ by Miquel Ruiz. - Photo Exhibition ‘Blood and Honey’ by Ron Haviv. - ‘Besieged Sarajevo’ permanent exhibition. Historical Museum of B&H. - 20:00: ‘The night of Radio Zid’. Aida Kalender interviews some of Radio Zid contributors. Audio, video and photo war archives from Radio Zid. - 10.00: Visit of the Tunnel Museum with Edis Kolar, head of Tunnel Museum. - 11.30: Promotion of the virtual FAMA collection ‘The Siege of Sarajevo’. Meeting Point. - 18.00: Exhibition of 15 young Bosnian photographers ‘ROOM 15’, organized by the Goethe Institute and the British Council. Kriterion. - 18.00: Presentation of the book ‘Sarajevo, the book of the siege’, an initiative of journalist and writer Piero Del Giudice. Authors are Abdullah Sidran, Izet Sarajilić, Dževad Karahasan, Danilo Krstanović, Marko Vešović and Tvrtko Kulenović. Museum of History of B&H. - 18:00: Exibition of war photographs by Fehim Demir. Bosnian Culture Center. - 21.00: 3D Mapping of ‘The Siege of Sarajevo Museum’ project, based on the FAMA collection, run by consortium FAMA / MESS / OGBiH / YIHR BH, on the future museum location. Park Hastahana, Marijin Dvor. - 09.00: Panel discussion on ‘Media in war and peace time’. A debate on the role of the media during and since the Bosnian war, organised by the AFP Foundation and the Council of Europe, in partnership with the Press Council and Association of Journalists of Bosnia and Herzegovina with the generous support of the Irish Government. Holiday Inn. 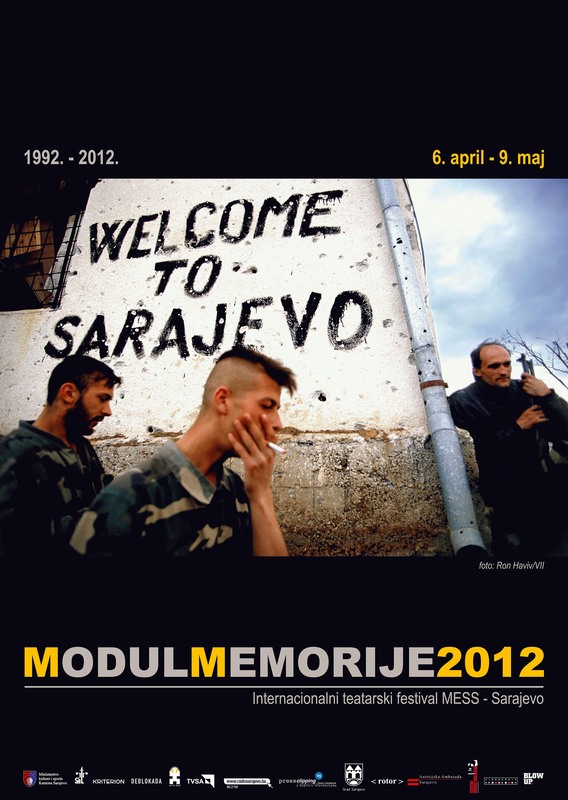 - 15.00: ‘Sarajevo 2012’ conference, organized by Le Monde reporter Rémy Ourdan and Festival MESS Memory Module artistic director Nihad Kresevljakovic. The conference includes a screening of the photo book ‘Bosnia 1992-1995’ edited by Jon Jones with Rémy Ourdan and Gary Knight. - 18.00: The 2012 official ceremony organized by the City of Sarajevo. - 20.00: Dinner with all foreign reporters, Sarajevo partners and friends, Holiday Inn war staff and others. Holiday Inn. - 10.00: Visit of the Tunnel Museum with Edis Kolar. - 11.30: Gathering at Kurt Schork’s grave, with Kurt’s partner Sabina Cosic and friends. And thoughts for Paul Marchand, Miguel Gil Moreno and others. Lion Cimetery. - 17.00: Exhibition of photographs by Dejan Vekic, Zoran Kanlic, Danilo Krstanovic. Java Galery. - 18.00: Launch of Ed Vulliamy’s new book, ‘The War is Dead, Long Live the War’. Pansion Hondo. - 19.00: Exhibition of photographs by Jim Marshall, organized by MESS. Sarajevo War Theater SARTR. - 22.00: Party organized by Damir Niksic. Rock Teatar Cafe.